Benefits such as fast pay-outs, hassle-free application processes without unnecessary admin and fixed interest rates are a major draw factor for individuals in search of finance. When pressing financial needs such as education costs or medical expenses demand one’s attention, the last thing needed is a drawn out process for accessing cash. Finance 27 Loans is a leading financial services provider which aims to service this market of individuals as efficiently as possible. Individuals in need of quick access to cash can get access within the range of R500 and R3000 from Finance 27. Individuals can also get an option to renew and apply for funds in addition to the initial loan while still paying the same interest rate. Applicants need to be above 18 years of age, South African citizens with a valid I.D and be permanently employed. They will need to present their current payslip, proof of residence and have a bank account where their loan repayments will be deducted. 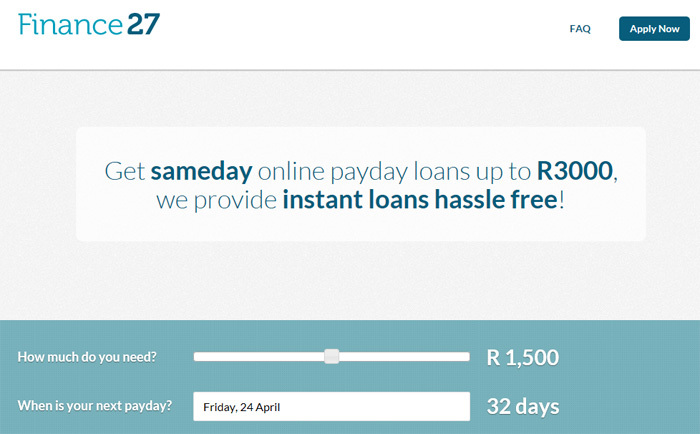 Visit www.finance27.co.za for more details about Finance 27’s same day loans.